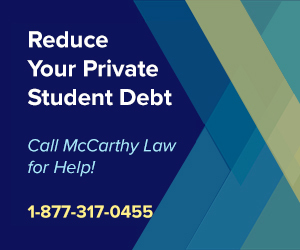 In 2019, one of the fastest ways to get rid of your student loan debt is to use the Department of Education’s Closed School Loan Discharge Program, which is one of the best Federal Student Loan Forgiveness Programs currently on offer. Called a “Closed School Discharge”, this program allows you to wipe out student loan debt from a school that shut down before you were able to finish their education program. One thing to point out about Closed School Discharges is that they are only available to people with Federal student loans, but that as long as your loans came in the form of Federal Direct Loans, Federal Family Education Loans (FEEL Loans) or Federal Perkins loans, you’re eligible to get rid of them! Who Qualifies for a Closed School Discharge? The specific requirements of the program state that you must not have completed all of your courses required for graduation, and that you must have either still been attending the school at the time it shut down, or within 120 days of the official closure date. If you satisfy those requirements, the Discharge approval is basically an automatic process, and one that’s relatively easy to get, so I would highly recommend that you pay close attention to this post and follow the application instructions closely, because doing so gives you a really good chance for having your student loan debt entirely forgiven. Keep in mind, however, that even if you do not qualify for the Closed School Discharge, you may still be able to challenge the validity of your debt via the Borrower’s Defense Against Repayment Program, which is especially powerful against the types of schools that have been closing down in recent years (For Profit Schools, Online Schools, Schools with dubious reputations, etc.). This program has been popularized by three recent closures of enormous For-Profit Schools: first, the Corinthian Colleges system in 2015, then the ITT Tech Schools and Westwood College in 2016. For details on getting a discharge from these schools, please visit my pages about the Corinthian Colleges Student Loan Forgiveness Program, the ITT Tech Student Loan Discharge Program, and the Westwood College Student Loan Forgiveness Program. What’s especially awesome about this program is that you can still qualify for the Closed School Discharge even if you were on an approved leave of absence from the school when they shut down, as the Federal Government would still consider you to have been “enrolled” even though you were out on LOA. Basically – the program was created for people who ended up screwed when their school shut down, with no way of continuing the program they’d racked up student loan debt to pay for. How do Closed School Loan Discharges actually work? It’s relatively simple. Contact whoever services your loans. This is the company or organization that you send your monthly student loan payments to. Since each servicer has a different applications process, you’ll need to get in touch with whoever services your debt to figure out what they need to process your application. Once you’ve received the application paperwork from your loan servicer, fill it out completely, then submit it via whatever means they allow (some loan servicers allow Internet-based applications, while others will need them faxed, or sent via snail mail). One important thing to keep in mind is that you’ll need to continue making payments until your loan servicer tells you (in writing) that you don’t have to issue them anymore. As you will not be approved for a discharge until you’ve received the official paperwork, any payments you miss after applying (but before receiving approval) could lead to financial problems. If you’re having trouble getting the paperwork from your loan servicer, then you can grab the 2016 Closed School Discharge Application Form here instead. Note that the link above is to the official Federal Government application form, which you can fill out and then submit to whoever services your loans. If you don’t know who services your loans, there are a few simple ways to sort that out. The easiest way to figure it out is to look at your monthly student loan bills to see who your payments are being sent to. You can then try Googling their name and address, and should be able to quickly identify the company and find their contact information. Another way to get the details is to use the Federal Government’s official website, called the “My Federal Student Aid” site, and located here. Visiting this site and logging in will allow you to pull the relevant details you need to complete your Closed School Discharge application. If you can’t sort out the website login, then you can call the Federal Government’s official student aid phone number at 1-800-4-FED-AID (1-800-433-3243) and ask them who services your loan. 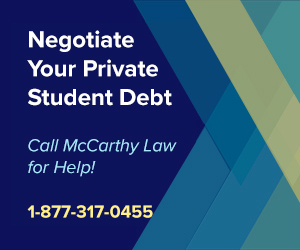 If you STILL can’t figure out who services your loans after trying all of the above, then you probably won’t be able to sort out your Closed School Discharge paperwork, and I would absolutely recommend enlisting the help of one of the paid services available. 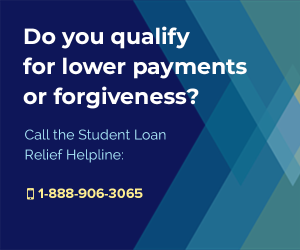 These companies will handle the entire process for you, typically for a few hundred dollars, and my favorite company that offers this service is called the Student Loan Relief Helpline, who you can reach by calling 1 (888) 906-3065. If you’ve been affected by a school closure, then you may also be eligible to get a refund from your state (which comes in addition to the Federal Government money you’ll be getting), through the State Tuition Recovery Fund program. To find out if you’re eligible for this benefit, you need to contact your state’s Postsecondary Education Agency.” This is the group that runs higher education in your state, and who is responsible for determining laws, monitoring compliance, enforcing regulations, etc. To figure out who you need to talk to, simply head to Google and search the phrase “YOURSTATE Postsecondary Education Agency”. Obviously, replace “YOURSTATE” in the previous sentence with whatever state you live in. As an example, if you’re from Texas, you’d search the phrase “Texas Postsecondary Education Agency”, and you’d get results with their website, phone numbers, email addresses, etc. Contacting this agency will allow you to see if you’re eligible for any State funds, and it’s worth checking, because a five minute phone call could save you thousands of dollars. If you don’t want to get your debt discharged because you’re interested in finishing your higher education program without having to start all over, then you should know that your other option is retaining the credits you earned at the school who closed via process known as credit transfer. It’s possible to apply for transferring credits earned from the school which closed to a new school, who offers a comparable program, and then to finish up your degree or whatever program you were enrolled in at the new destination. Please note that this will invalidate your opportunity to receive the Closed School Discharge, but it will allow you to continue with your education program without the setback of lost time and effort. Applying for the Discharge means that you get all your money back, but essentially all the time you spent in school ends up being wasted. For some students, it makes more sense to transfer credits and finish the program than it does to get the money back (especially if you’re really close to finishing). Many people are being affected by schools closing down, and it’s likely that this population will only increase moving forward, since there are several very large for-profit school systems that are having trouble staying open for business. Below you’ll find some of the most common questions regarding the Closed School Discharge program. If you don’t see your question listed below, please feel free to post in the comments section at the bottom of this page and I will do my best to answer your question as quickly as possible. My School Shut Down. What Should I Do? You either need to apply for for the Closed School Loan Discharge, which is outlined above on this page in detail, or you need to apply to transfer your credits to another school, where you can finish your education program. The choice is up to you, and depends entirely on your unique educational and financial situation. People with a ton of debt will probably want to choose the discharge, while people really close to completing their educational program will probably want to apply for transfer credits. Check the section of this page above called “Who Is My Loan Servicer”, which details the process of figuring out who services your loans. Once you know who services your loans, you can contact them to ask how much money you still owe, and then determine which option (the Closed School Discharge or the Transfer Credit process) will work best for you. 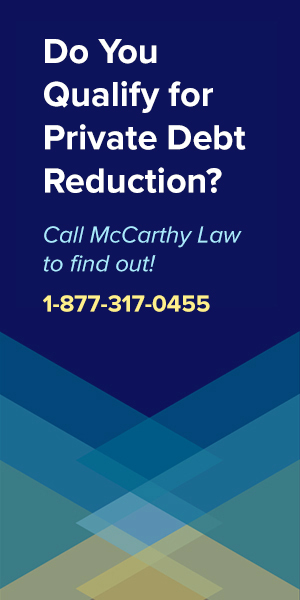 What Is A Loan Discharge? 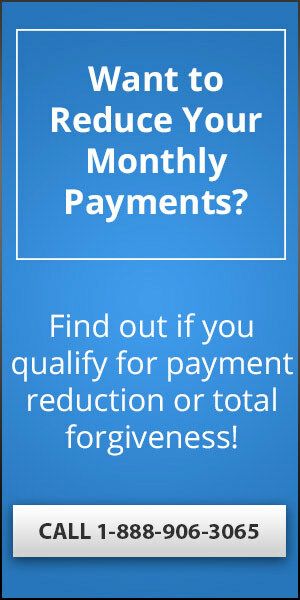 It’s the same thing as “Loan Forgiveness” – a complete wiping out of all the debt that you still owe, but in the case of the Closed School Loan Discharge program, it’s even better… because this program doesn’t just forgive your remaining debt… it also REFUNDS everything you’ve already paid. And that’s what makes Closed School Loan Discharges the single best way to Erase Student Loan Debt Without Paying For It. If you qualify for this program, you should absolutely take advantage of it! How Does a Discharge Affect My Credit? Because you’re going to get a refund for any and all payments you made previously on your eligible student loan debt, either voluntarily or through forced collection processes (like wage garnishments, etc. ), your credit is likely to be impacted. 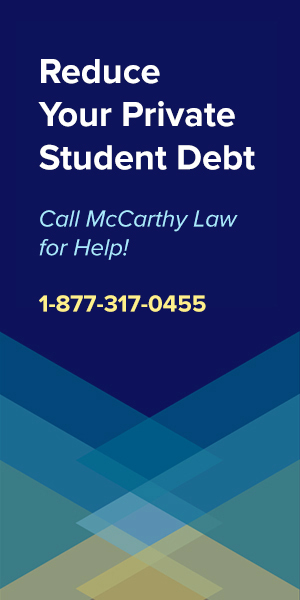 If you had credit problems resulting from your student loan debt, then those are likely to clear up, because your discharge will be reported to the credit bureaus and any negative activity on your report will be cleared. Fortunately, there’s no deadline for applying to the Closed School Discharge program. No matter when your school shut down, no matter how long it’s been, you can still apply for the discharge, as long as you haven’t already transferred your credits elsewhere. And that’s another great thing about this program, because many people won’t even find out about it until long after their schools have shut their doors. Please ask questions that aren’t answered here in the comments section below, and I’ll try to answer then within 24 hours. 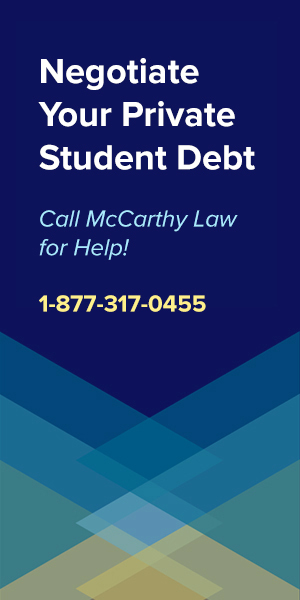 Alternatively, call whoever services your loan to ask them for details about the Closed School Discharge program, or try calling the free Federal Student Aid Information Center at: 1-800-4-FED-AID. 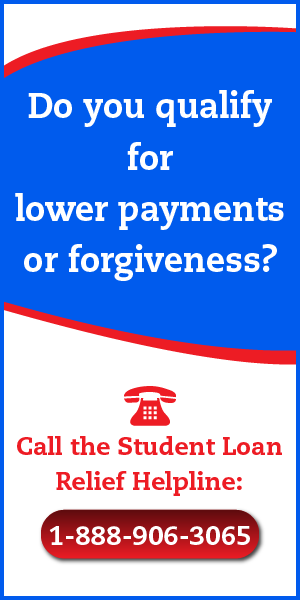 Or, if you want to pay a company to deal with the process for you, call my favorite company called the the Student Loan Relief Helpline, at 1-888-906-3065. 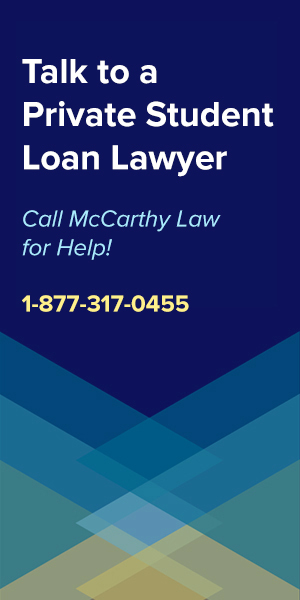 You’ll have to pay several hundred dollars for their assistance, but they will handle the entire applications and approvals process for you, battling with loan servicers, the Federal Government, or anyone else that is involved in the process. 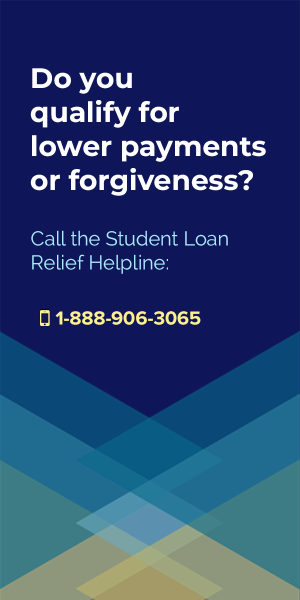 If you have trouble understanding how this works, managing detailed paperwork and filling out applications, then it may be worth paying someone like the Student Loan Relief Helpline to take care of it all for you. Managing this site and producing all this content is a time-consuming, expensive process for me, and I can only continue to do it with the support of the community (meaning YOU!). If you found this page useful, please share it with your friends and family members. Email it to them, post a link to the site on Facebook, Twitter, Tumblr, or Reddit. The more people who visit my site, the more time I can dedicate to producing detailed, informative, and helpful content like this. Finally, thanks for visiting, and please check back soon for further updates. My school (Argosy University) recently closed, and a teach-out to another crappy online program was provided. Most of us were pushed into signing on, but then some of us changed out minds later. One of my classmates recently received a letter that his school loan would not be discharged because he was offered the teach-out, even though he did not take that option. Is that really allowed? The Federal Loan site is pretty vague, but it does say that a person doesn’t qualify if they are participating in a teach out, which we opted not to do. I guess the question is, can we fight that decision? I read in another website that if a loan is discharged but then the individual ends up completing that program of study at another institution, they may have the discharged loans reinstated and be responsible for paying them. My question is: How do they know? How can the Federal Student Loan people see if a student has transferred credits or has been offered a teach out or eventually finished their program of study? There is so little information on how/if these institutions are communicating. I would like to be more clear on the subject in order to make informed decisions regarding both my education and my finances. Good question, and honestly, I’m not entirely sure, since it sounds like you accepted the teach out, but then changed your mind? Try calling the Department of Education’s official BDAR Hotline to see what they think: 1-855-279-6207. What you read elsewhere is true – you can’t discharge a loan if you are going to transfer the credits and apply them at another school, so you basically have to pick either getting rid of the loan and sacrificing the credit, or transferring the credit and keeping the debt. Everything is reported to the Department of Education, that’s how they know. Kate, I am also an ex Argosy student. And you are right… I’m being flooded with offers to “come here and finish your degree”. I am not going to. I have already applied for student loan discharge and currently my loans are in forebearance. They explained to me that this is what they do so I do not have to make payments while they do what they need to do to make the loans go away. 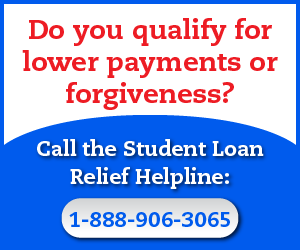 I highly recommend calling your student loan servicer directly and discussing it with them. I had 10 classes to go and I’m kind of bummed… but I also believe that things happen for a reason. This is actually the SECOND Argosy closure I’ve endured. The first time they closed my Dallas campus, but offered to keep me in the online only part so I stuck it out… this second closure… well… I’m out! Best of luck to you! !